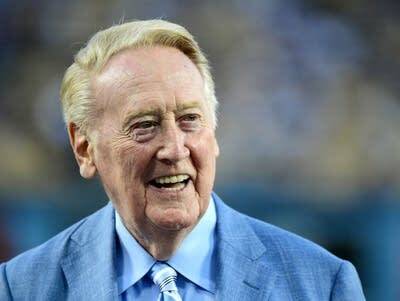 Vin Scully is a legend of baseball broadcasting, after 67 years covering the Los Angeles Dodgers — the longest any broadcaster has ever been with a single team. The fact that Scully is soon to retire adds special poignance to anything he says on air this season, so Dodgers fans loved it when Scully fell for a little baby who appeared in a cutaway shot during a recent game. Adopting a lilting voice, Scully seemed as if he was almost trying to sing the youngster to sleep. Scully called the incipient nap almost like a baseball play. "Dad's doing his duty! He's got a wide-eyed beauty. Trying to put the baby to sleep...he's gaining on it! The sandman is coming, the sandman is...no, you don't want to go to sleep." If Vin Scully isn't available next time your little one needs to nod off, try YourClassical's Lullabies stream.